Immersive technology is much easier to use in the classroom than you might think. In fact, there's no need to buy expensive technology to use or create it. Beyond the experiences, our students can be creators of immersive tech content. Find out how your students can experience and create with augmented, virtual and mixed reality using devices you already have in your classroom in this informative webinar. 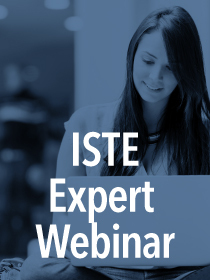 This ISTE Expert Webinar is presented by Jaime Donally, ISTE Author.